ZenKitchen is one of the few restaurants that I like to save for special occasions. A very special occasion took place last weekend, my 29th birthday. Accordingly, Kyle took me to Zen Kitchen to celebrate. I consider myself to be somewhat of a ‘foodie’. I like to sit down to a nice meal and discuss it. I like to talk about what makes it special. Caroline Ishii, the chef at ZenKitchen, really impressed me with this meal. Dave Loan impressed me with his drink creations. When you go to ZenKitchen, the first thing I recommend is making a reservation, especially if you want to eat on a weekend. It’s a fairly small space and apparently it is very popular. After reading my review you will probably see why it is so popular. Also the reason why it’s saved for only special occasions for me is because it is pretty expensive. Keep that in mind when you decide to dine out, maybe trade two Green Earths and a Table for one night out at Zen? Upon entering the restaurant we were asked by the hostess if she could take our coats. I think that is a bonus point right off the start. I really dislike bringing my coat to the table in the winter. It’s just too bulky. It’s also a good idea for the restaurant owners too, in order to preserve their furniture from the evil salt and dampness that may be lingering on the people of Ottawa’s outerwear. Kyle and I both ordered the Four Course Chef’s Tasting Menu for $48 per person. All that we were told was that it was Mediterranean themed. I almost didn’t go for it because when I think of Mediterranean food I think of olives, which I really can’t stand the taste or smell of. But I decided to take a chance and it turned out to be a really good chance to take! For drinks, we both ordered the Kimchee Caesars for $8 each. Not overpriced byOttawa standards. It was perfectly spicy and tasted like summertime. For those who know me well, I had an obsession with Bloody Mary’s this past summer. 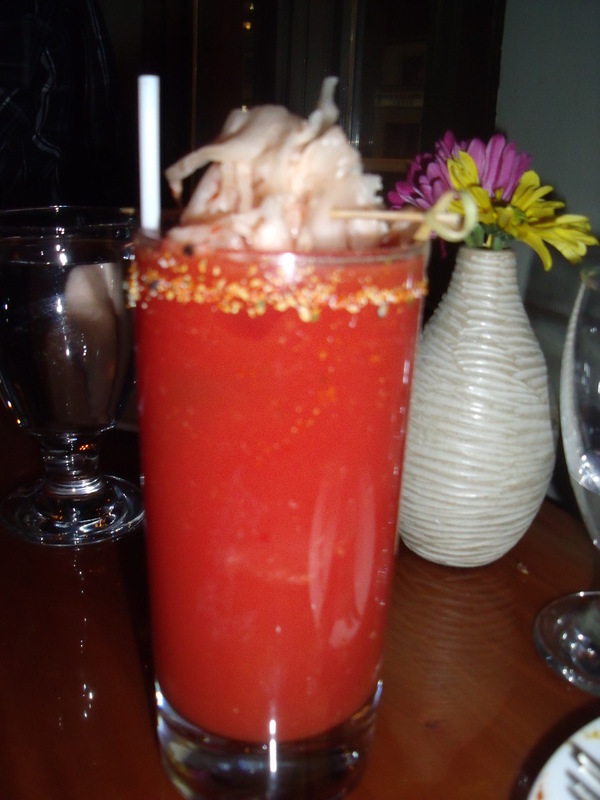 The Kimchee Caesar consisted of tomato juice, vodka, kimchee and a salt rim. Kimchee is something I would have never thought to put in a drink. Very creative and delicious. Thanks Dave! 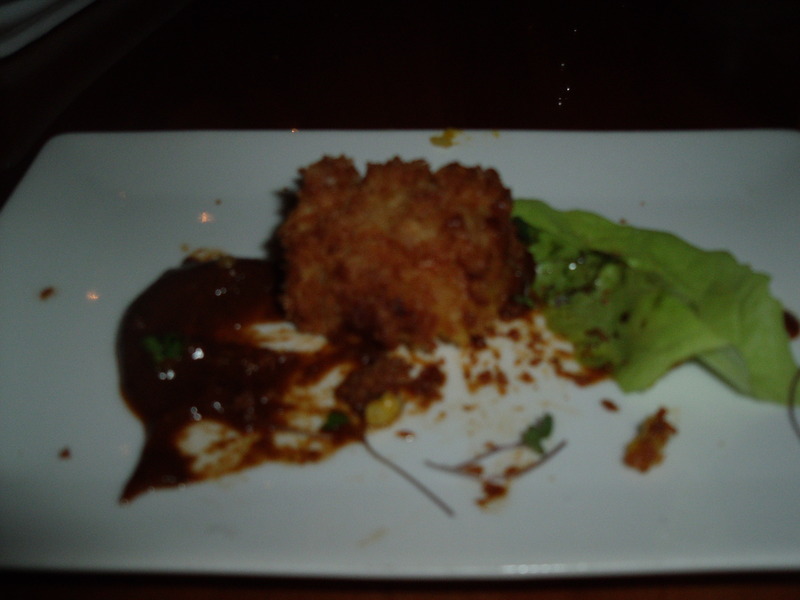 The first course that came out was a butternut squash risotto ball with a panko crust and a chipotle sauce. It was fabulous. The butternut squash was so creamy and melted in my mouth. It almost had a sort of cheese-like flavour to it. I forgot to take a picture until I was halfway through it, so it doesn’t look as fancy in the picture as it did when Chef Caroline brought it out to us. The only thing about this meal that would improve it is a second or third risotto ball! Second course was surprising. 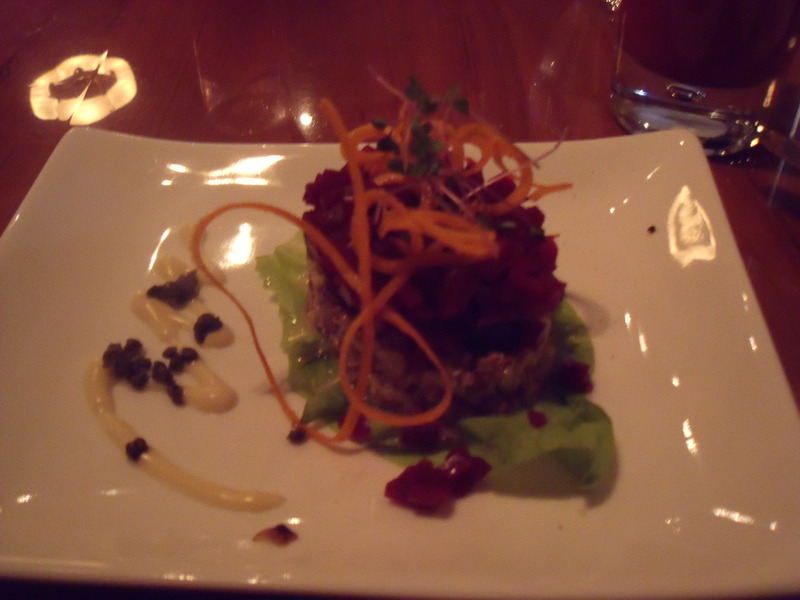 It was a quinoa tabouli salad with beets and a horseradish aioli. I think this very special salad was created with Lebanese elements. Very creative and presented beautifully. It tasted even better than I would have thought. The quinoa had a very nice sweetness and some citrus notes to it. Throughout the quinoa part were little mustard seeds that popped in your mouth. I would try to duplicate it at home but I wouldn’t know where to start! Kyle is someone who really does not like beets, so this was worrying me while he ate it. I think since the beets were cut so small and each bite incorporated the other elements of the meal, he really enjoyed it. Also the beets lacked the earthiness that they usually have. They were juicy and sweet. Bonus. Third course was the main meal. 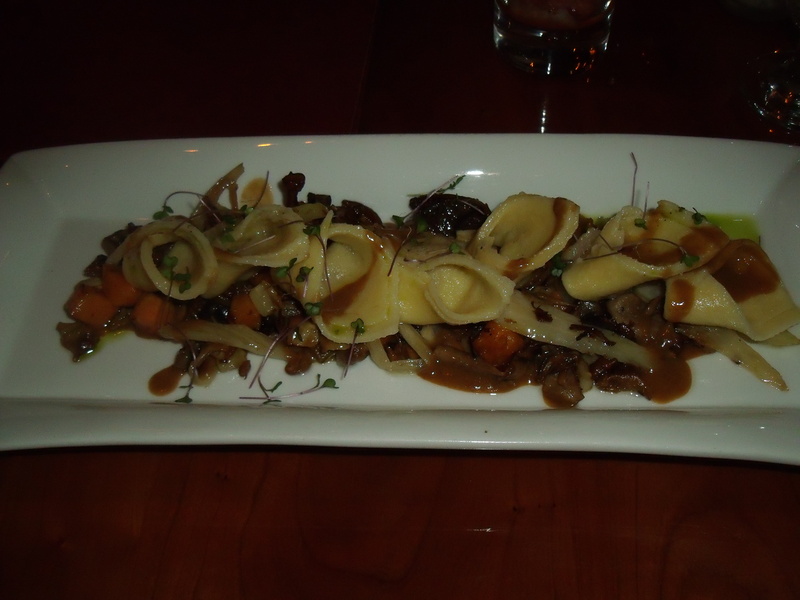 It was hand wrapped ravioli with caramelized onions, exotic wild mushrooms, and tempeh. I love fresh pasta, and it’s one of the things I miss most, being vegan. The pasta element was served very al dente, just how I like it. I love onions and I love mushrooms and I love pasta so I am a hard critic to please when it comes to these things. They have to be cooked to perfection, and they were. The onions were not mushy and were nice and sweet. Within the mushroom and onion medley were some other vegetables, cooked to perfection as well. I believe I tasted some sweet potato. The only element of the dish I couldn’t find was the tempeh. I think it was stuffed in the ravioli but there was so little of the stuffing that you couldn’t tell what it really was. However, I overlooked that aspect and consumed every drop of food on my plate. Yums. 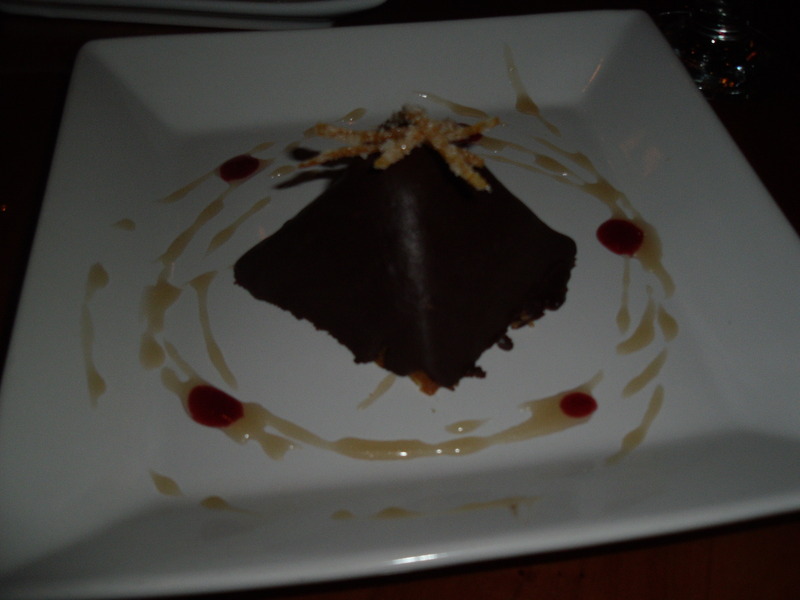 The fourth and final course was an orange and cardamom pyramid cake covered in chocolate ganash with raspberry coulis and candied orange peel. At first I was not very impressed. I really don’t like fruity flavours messing around with my chocolate. However, after the other three amazing courses, I trusted Caroline enough to giv ‘er a try. I am glad I did. Absolutely divine! The cake wasn’t overpoweringly orangey or cardamommy; it was nice and moist. The chocolate ganash was a compliment to the cake. I loved it. After dessert we wanted one more drink since it was such a special night. Kyle ordered some Laphroaig Quarter Cask Single Malt Scotch $7.5 and I ordered a Caipirinha $8. 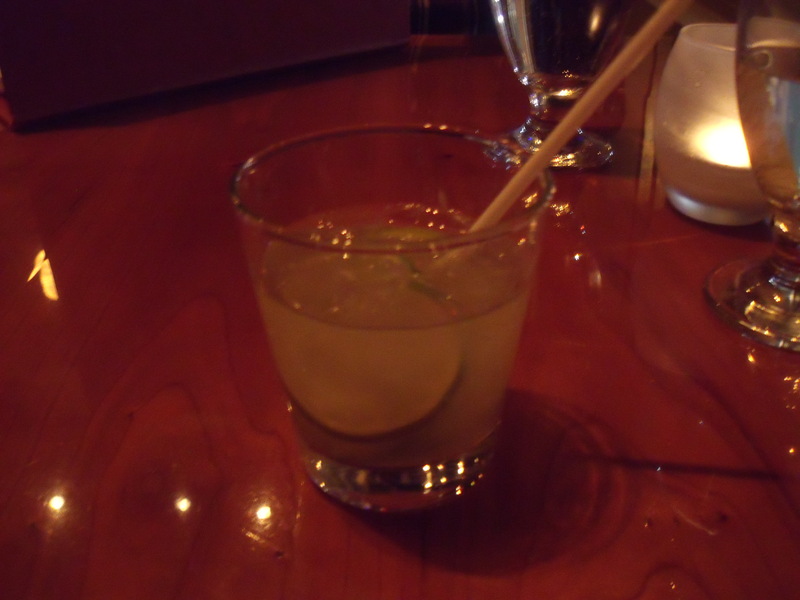 The Caipirinha consisted of Cachaça, lime, organic cane sugar. Cachaça is a Brazilian type of rum. I really enjoyed this one. It was refreshing and a good way to end the meal. Except…the meal was not over. With the bill came two chocolate mint truffles. Melt in your mouth goodness. Overall the meal was excellent. I am not one for surprises so it was very unlike me to order something and not know what it was going to be, but I am starting a new year so maybe this year I will just let go a little and try new things. I love how creative Chef Caroline and Dave are. Not once in my entire meal did I taste the typical Greek or Italian flavours one would normally assume of Mediterranean cuisine. Instead it was surprising, sweet, rustic, and citrusy. I loved every bite. I liked the ambiance of the restaurant, dimmed lighting, cute artwork (I think by a local artist? It has changed every time I have been there…a whole three times now! ), and I didn’t even notice the music (good, because if I notice it it’s probably because it’s annoying me).